Just in time for Valentine's Day here is my February tutorial (yes, I am trying to keep my resolutions). This ring is basic but fun when you add the cluster of beads to it (tomorrow's post). Have fun, this tutorial is in 2 parts. Part 1 is the standard love knot and Part 2 is the cluster. Please excuse my dry cracked hands and fingers, hazards of working with wire. I was going to put some hand cream on but it is hard to work with wire when your hands are slippery. 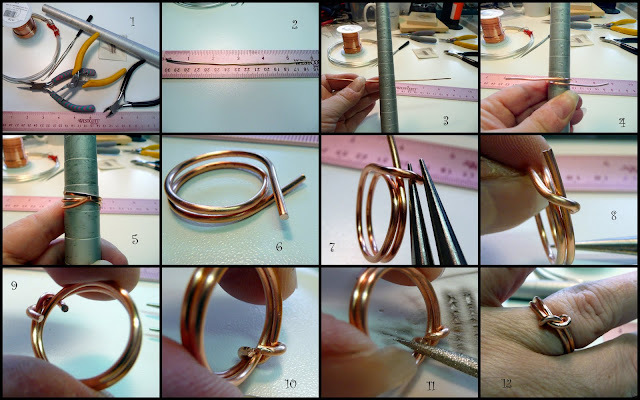 The following ring design can be made in copper, silver or brass, but I would suggest making it in copper as that metal is cheaper until you get the hang of it. • Ring Mandrel or a wood dowel the size of ring you want to make. 5. Continue wrapping the wire until the open ends are at the back (or in this case the front now. 10. Tuck the ends up under the ring tightly (this may mar the surface of your ring as you are using your flat nose pliers, but those marks are easily removed. 11. File under the ring ends until they are no longer sharp then polish with cloth, under and on top. Stay tuned for tomorrow's post where we will build upon this principal and add the cluster of beads. Great simple tutorial I'll check back for part two. Love copper.